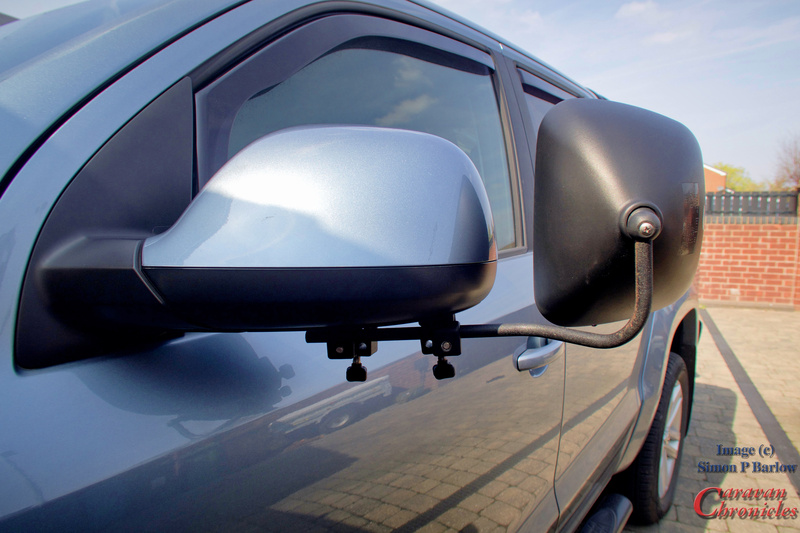 A couple of eagle-eyed mirror aficionados have spotted that we use Milenco Grand Aero 3 towing mirrors… but they also spotted that there was something different about the mounts. OK I’ll have to admit you are an eagle eyed bunch! 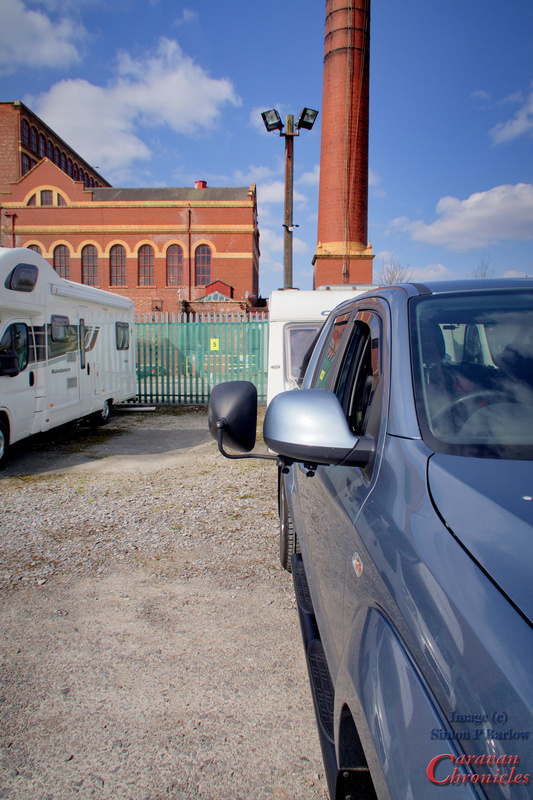 On the Amarok, the mirrors are quite big and if I get them adjusted about right I can just see down both sides of the caravan… we’re not 8 foot wide. 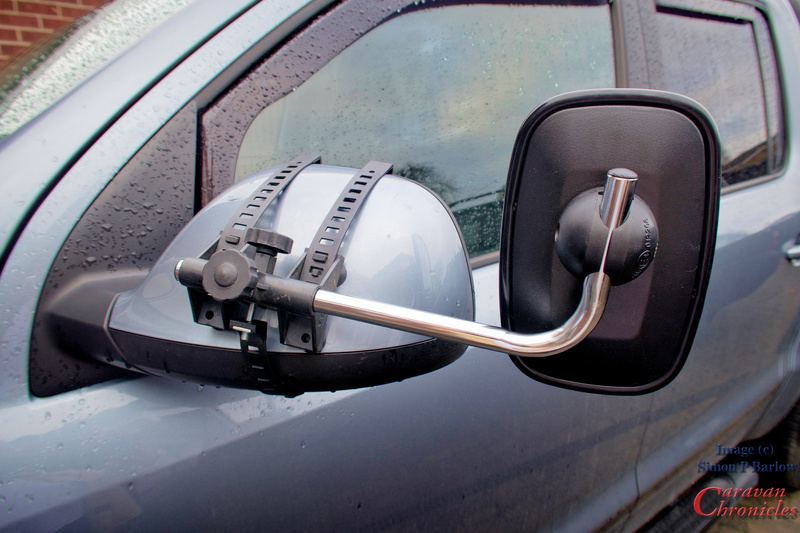 However, driving without mirrors is more likely to attract attention and it’s easier and safer just to fit a pair. 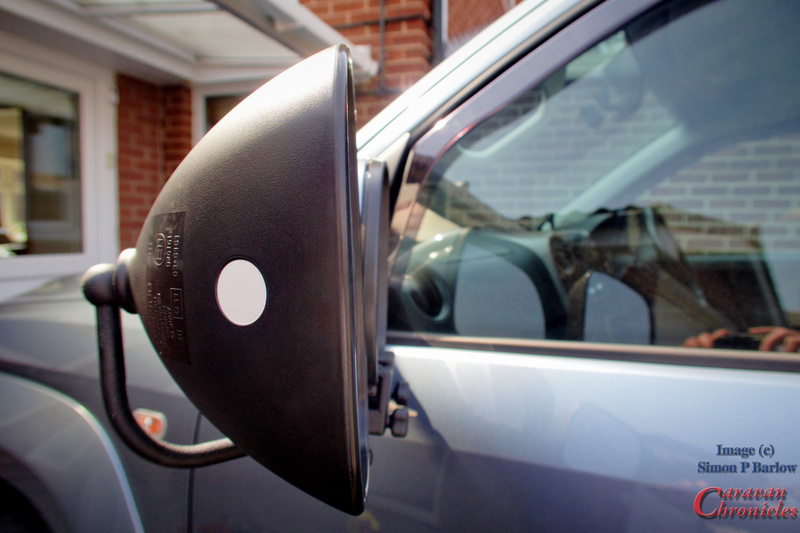 I first went for a brand that I’d used on the Land Rover Freelander, however the Amarok’s mirrors are quite deep and it wasn’t till I tried them that I realised how much of an issue that was…. 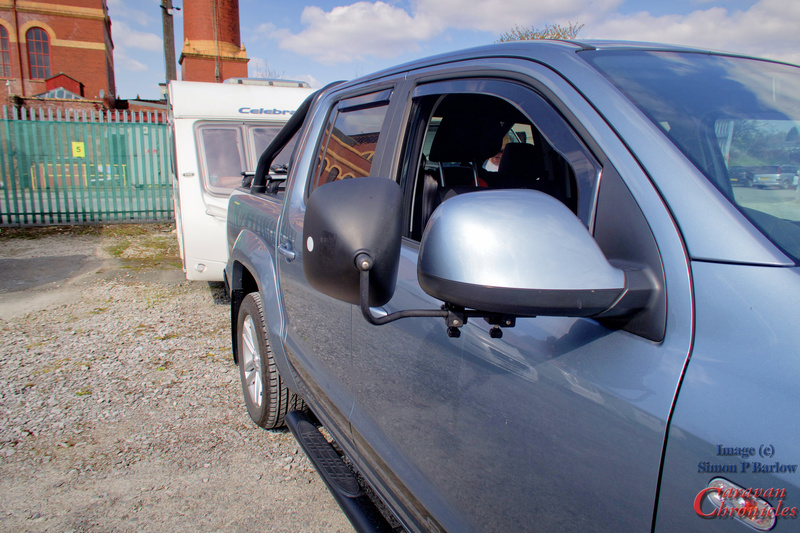 The other issue I had… I didn’t particularly like the fitting….. it was about on the limits of extension and about 25% of the mirror was obscured by the Amarok’s door mirror… just at the point the would allow you to see the wheels of the caravan. Not ideal. So I looked round for a mirror that would move the face of the mirror rearwards in about the same plane as the normal Amarok mirror. The added depth of the Milenco Grand Aero looked as though it would do the job perfectly. Actually it was a little too much. As the mounting for the mirror was now on the door mirror plane, not as the previous mirror the back of the mirror housing it shifted the face of the Grand Aero too far rearwards. I liked the vision the Grand Aero gave and the mounting. I just happened to have some lengths of 12mm steel tubing and a bending tool. Maybe I could solve the problem without searching round for other products. I used a welding rod to hand bend a profile that seemed to put the mirror into the right position. I worked out I’d only need two bends to get the mirror in the right position. I installed the two mounting brackets on the door mirror in the final position I wanted them and slid a length of tube into them. Marking where I wanted the first bend to be and using an angle finder to approximate the angle that would move the mirror far enough forward so the face was in line with the door mirror face… this then gave me the point to start the bend upwards to get the mirror at the correct height. 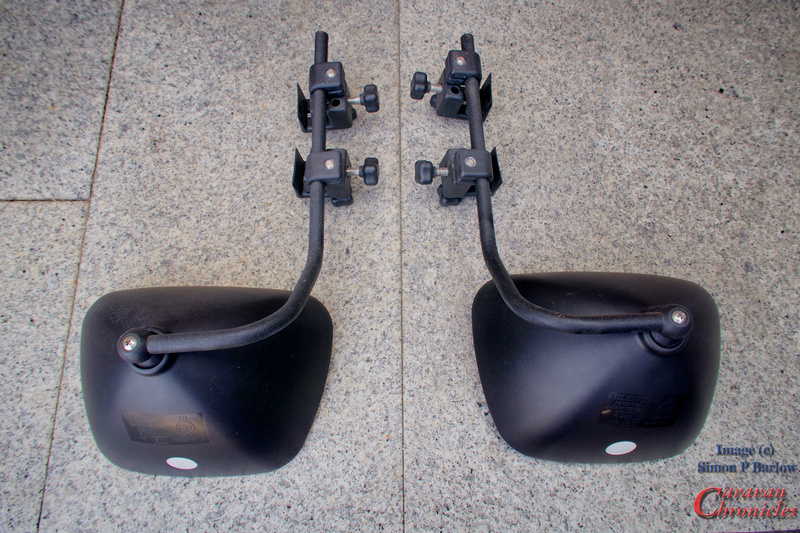 Ok before I get a lot of comments asking why installed the mounts on the lower edge of the mirror… two reasons…. if they do move about or squish down on a bit of grit any scratches won’t be seen in the painted area of the door mirrors and from the driving position they don’t obscure my view if I have to look past the top of the door mirrors. 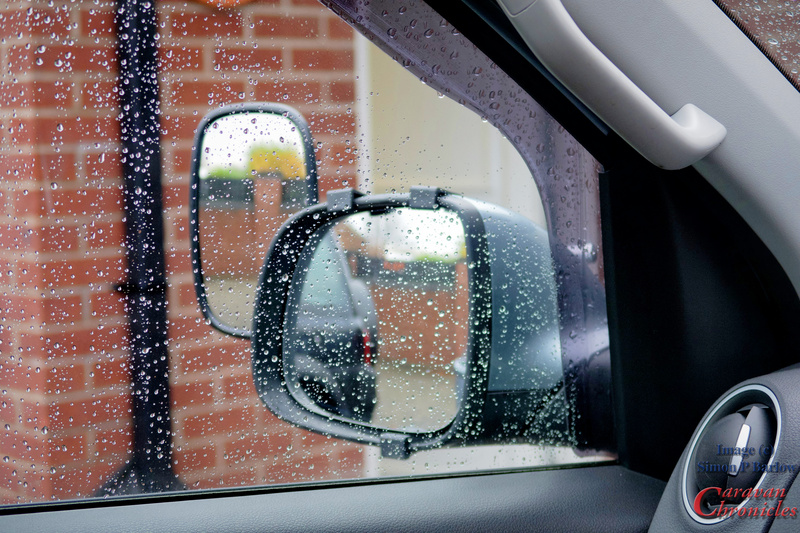 I’ve also noticed when its raining I don’t get nearly as much water running down the face of the door mirror. And another reason…. 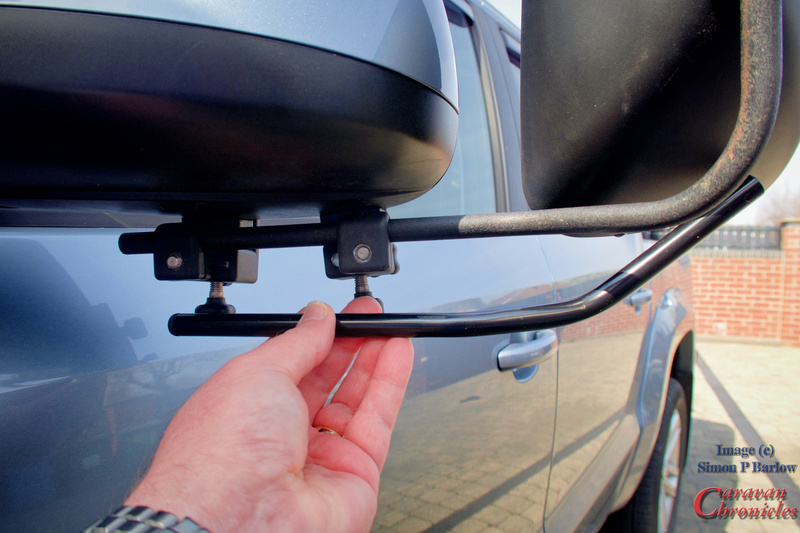 the bottom of the door mirror on the Amarok is not quite as curved and the clamps fitted more securely. I’ve got everything dialed in now to the point where I don’t actually need to adjust the mirrors each time I fit them. At this point I hadn’t cut the tube to length on the vertical section so I had the chance to adjust the height of the Grand Aero. After a bit of trial and error that involved a clamp and running round to the driver’s seat… and back again to adjust I got what I thought was the right height for me. As you can see in the photo above, the reflective face of both mirrors is in near perfect alignment… and for me that makes it easy when driving as I don’t have any perceived shift in focus. The picture below is from the drivers position… I put the camera as close as I could to where my eyes are and I get a great view rearwards. 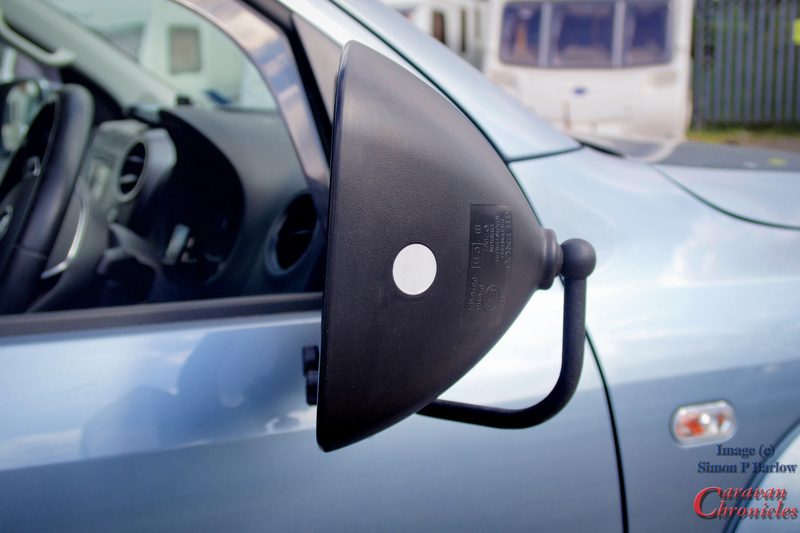 Note that installing the mounting clamps on the bottom edge of the door mirror does not block the forward side view over the door mirror. The driver’s side was bent the same… just opposite ‘handed’ and the length worked out right for the height too. 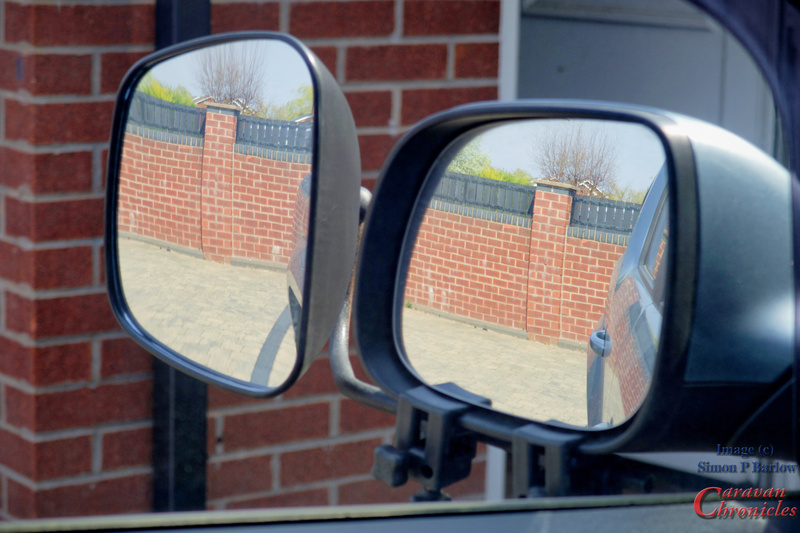 When seen from the front… even though I’m not quite ‘square on’ to the caravan, I’m angled slightly to the left when sat in the drivers seat, the mirror is fully outside the extended side line of the caravan giving me a great view. I gave the now bent and drilled tubes a light emery and de-grease followed by couple of coats of grey acid etch primer. This was topped off a few days later with a fine bed liner spray. This game the arms a durable coating plus the bed liner finish is quite ‘grippy’ and allowed the clamps the hold fast without too much yanking on the knobs. We have been using these now for about two years and for me they work out just fine. I had all this stuff in the Bat Cave as it was purchased for other projects, so the mirror arms didn’t really cost me anything. Both arms were made out of one 1 metre length of 12mm steel tube. OK… so that title was a bit dramatic! However here’s the thing… I don’t think everything is peachy with Euro 6 engines and charging leisure batteries. If you are a regular reader, you know I have recently installed one of Sterling Power’s Wildside units (and so far I’m super happy with it!) but I did get an email from someone who had read all my postings about it and asked me if it might cure his problem. Here’s the gist of his email…. We had originally intended to spend a week down at Glastonbury which would have meant the 5 hour drive down would have been an excellent test for the Sterling Power Wildside unit’s first outing. However we had to cancel the trip literally the day before we were due to set off. In the few days between installing the Wildside unit and our planned trip to Glastonbury I had been exchanging emails and phone calls with Charles Sterling talking about some of the aspects of the Wildside unit and the direction that caravan electrics was heading in. 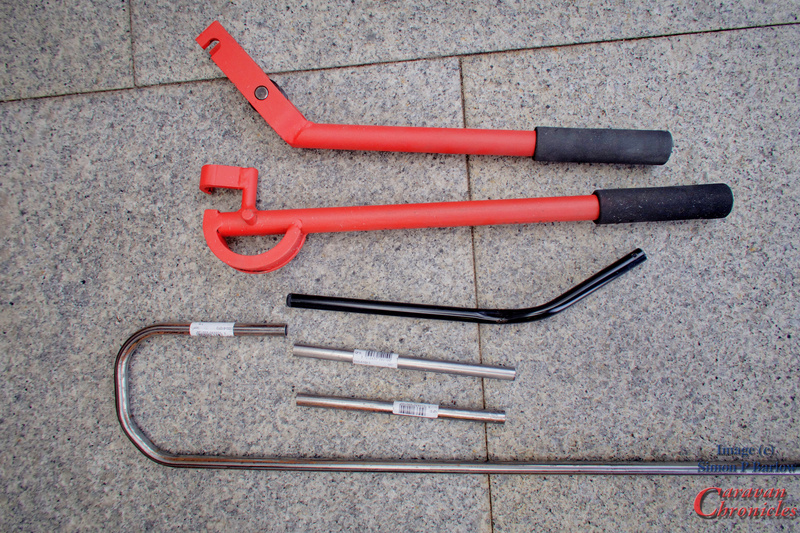 It’s time to wrap up the bike rack install. I had to wait a few days for the final rack to arrive. Although I had ordered a twin pack of the Thule FreeRide 532 from Holdcrofts via Amazon and they had shipped out a twin pack, it would seem that their courier had ‘lost’ one and to Holdcrofts credit as soon as I emailed them they dispatched another… which the courier took four days to deliver. 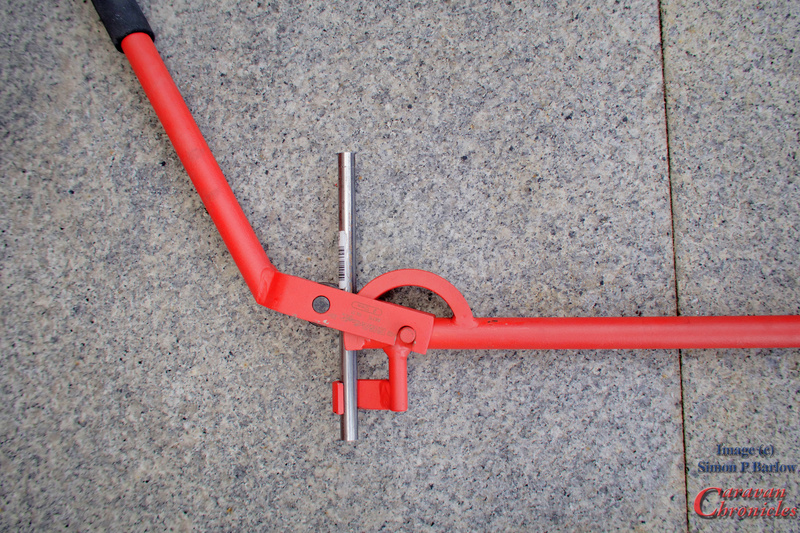 OK, so now to fit the actual bike carriers onto the rack I had previously installed a couple of days ago. We had opted for the Thule FreeRide 532 over the ProRide version. What put me off the ProRide were a couple of videos on YouTube showing just how easy it was to remove a bike supposedly locked on to the rack. The FreeRide 532 has two arms supporting the bike and offered an option for additional security…. which I’m not going to go into for obvious reasons! It’s been a few months since we bought our VW Amarok and I hadn’t originally intended it to take this long to install a bike rack or carrier. What slowed us down was sorting out the bits needed for mounting a bike carrier above the bed of the Amarok. In the USA, pickups are plentiful and there are various companies that make carrier systems and mounts for pickups. My initial thoughts it would be fairly easy and started perusing the Thule website. Unfortunately they did not sell the correct mounting hardware for where I wanted to mount the rack.. on the side rails for the Roll-N-Lock cover. This is really a follow-up to my previous post – Smart Alternators: how they affect Caravans and Motorhomes…. One of the little things that has been on my “must do something about that” list for a while is to address the problem we have with not enough places to plug things in and charge them. When we are in the caravan in the evening the front looks like a tech gadget table top sale… Macbook Pro, WiFi router/MiFi device, two iPhones, camera battery chargers, Fitbit charger and all these needed plugging in. The 4 way surge protected power strip I put there just wasn’t cutting it any more. A few days ago I fitted the Black Vue DR650S-2CH 16GB twin camera dash cam to the Amarok. All in all it was a vey easy install taking me less than two hours to accomplish. The longest part was actually tucking the wires in along the edge of the head liner so they can’t be seen. Helpfully Black View supply a little blue tool that helps you do this without damaging any of the interior trim. I also installed the Black Vue Power Magic PRO that allows permanent connection to the vehicles electrical system and gives you the ability to use “Parking Mode” which records continuously when you are parked with the engine off. If you have considered a dash-cam but don’t know where to start, one of the best introductory guides to Dash Cams that I have seen is by Techmoan.com. Just click on the link to watch it. There are also dozens of dash-cam reviews on His channel.